Though the film makes a few egregious historical changes for dramatic effect, The Longest Day pretty much lives and dies by its scale. 179 min. 20th Century Fox. Directors: Ken Annakin, Andrew Marton, Bernhard Wicki. Cast: Eddie Albert, Paul Anka (II), Arletty (II), Jean-Louis Barrault, Richard Beymer. Darryl F. Zanuck's labor of love The Longest Day coincided with the legendary producer's own re-conquering of the studio he built, 20th Century Fox. Defeating itself from within by bankrolling the runaway production Cleopatra, Fox was ready to listen when Zanuck visited its offices an unleashed a legendary tirade that won The Longest Day the release it deserved and won Zanuck his job back as the head of the studio. 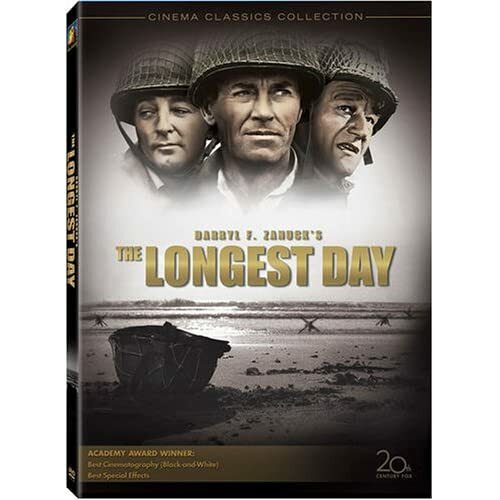 The Longest Day is the evidence of Zanuck's "never say die" recovery after the long, dark night of the soul caused by a series of high-profile flops. Instead of thinking small, Zanuck grasped once more for glory by securing the rights to Cornelius Ryan's historical account of D-Day and assembling a cast of "48 international stars" to enact it (though he was one of five writers on the script, Ryan also gets sole screenwriting credit). Three directors were contracted: Ken Annakin, who filmed the British episodes (and other clean-up work, as requested by Zanuck); Bernhard Wicki, who helmed the German episodes; and Andrew Marton, responsible for the American episodes. In addition to a Best Picture nomination, the film would win well-deserved Oscars for special effects and cinematography (Jean Bourgoin and Walter Wottitz). The title gets its explanation at the film's outset, when Field Marshal Erwin Rommel (Werner Hinz) states, "The first 24 hours of the invasion will be decisive. For the Allies as well as the Germans, it will be the longest day." In a progressive move, the German episodes were performed in German and subtitled, with Hans Christian Blech a standout as the right-thinking Maj. Werner Pluskat (Curt Jürgens and Gert Fröbe are also on hand). Representing the Brits are Richard Burton (resonant as Flight Officer David Campbell), Peter Lawford (as Lord Lovat), Kenneth More (as Capt. Colin Maud), Sean Connery (as Scottish Pvt. Flanagan: "Come on, ya bastards! "), and Richard Todd as paratrooper Maj. John Howard—ideal casting as Todd had served as a paratrooper in the war. Naturally, the Americans get the most play, beginning with superstars John Wayne (Lt. Col. Benjamin Vandervoort), Robert Mitchum (Brig. Gen. Norman Cota, clamping down on a soggy stogie), and Henry Fonda (the arthritic Brig. Gen. Theodore Roosevelt Jr., living up to his father's reputation). Teen idols Paul Anka, Fabian, and Tommy Sands share a scene as U.S. Army Rangers (also in the outfit: Robert Wagner and George Segal). Red Buttons gets the memorable role of the private whose parachute unfortunately catches on a steeple, and poor Sal Mineo fares even worse. Rod Steiger shamelessly extends his tiny scene by elongating his pauses, and young Richard Beymer (fresh off of West Side Story) gives the picture something approaching a character-driven throughline as a lost soldier who finally reflects to Burton's wounded officer, "I wonder who won." The visual answer (a cut to a triumphant Mitchum)—accompanied by a final, peppy music cue from Maurice Jarre—misses the opportunity to end on that somber note between Beymer and Burton. In fact, the original screenplay ended on a yet darker note that Zanuck later regretted excising: a sobbing soldier amid the carnage on the shore. Though the film makes a few egregious historical changes for dramatic effect, The Longest Day pretty much lives and dies by its scale. The sheer number of characters, while allowing an impressive breadth, reduces the drama to snippets. But the combination of choreography and photography (as well as the Oscar-nominated editing) can be simply stunning, as in the long, low-flying helicopter shots devised by Annakin to capture troop movements. Those recreations, which set a high standard for WWII action not fully eclipsed until Spielberg's Saving Private Ryan, are the film's enduring achievement. The first domestic Blu-Ray release in black-and-white, Fox's disc of The Longest Day, doesn't disappoint. Though the 46-year-old source material occasionally betrays a thin veil of vertical striations, the source is otherwise flawless, and the transfer an ideal rendering with excellent detail and great contrast. The DTS-HD Master Lossless Audio soundtrack honors its source while giving modern home-theater owners a dynamic listening experience. This is also a feature-packed Blu-Ray release, porting over all of the DVD extras from previous releases. Disc one includes two audio commentaries: one a heady, scholarly, attentive track with UCLA History Prof. Mary Corey, the other with director Ken Annakin (since it's spotty over three hours, the latter track is worth a listen only for rabid fans of the film—others should wait for disc two's pithier interview). Disc Two houses "A Day to Remember: A Conversation with Ken Annakin" (17:52), which hits the most interesting anecdotal highlights of Annakin's commentary. "History Through the Lens—The Longest Day: A Salute to Courage" (43:45) is a 2001 installment of the fine History Channel series, narrated by Burt Reynolds, that examines a film's making while noting the discrepancies between the film and the history it depicts. Participants include Annakin, Cornelius Ryan's daughter Victoria Ryan Bida, curator of the Cornelius Ryan Collection Douglas E. McCabe, Darry Zanuck's daughter Darrylin Zanuck, associate producer Elmo Williams, Richard Todd, Guts & Glory author Laurence H. Suid, Staff Sergeant Paul R. Sands, Pvt. Robert M. Murphy, Lt. Leonard "Bud" Lommel, Captain William Friedman, Sgt. Noel A. Dube, and Corporal Rudy Meyer of the German Army. 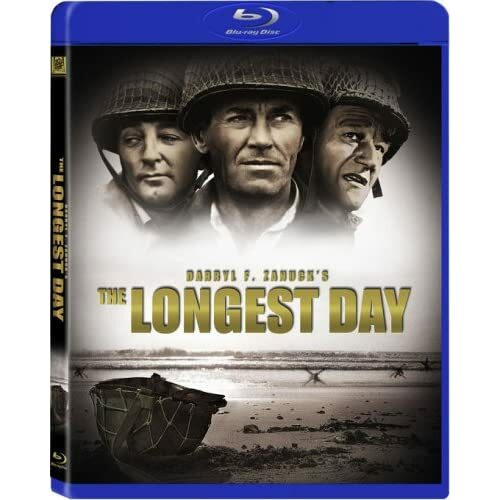 Next up is "Backstory: The Longest Day" (25:08), a 2000 installment of the Fox Movie Channel series that often doubles as a DVD extra. Here, the focus is squarely on the film's production. On hand are Annakin, Darrylin Zanuck, former studio executive David Brown, film historian Rudy Behlmer, Robert Wagner, Roddy McDowall, Red Buttons, Zanuck biographer Mel Gussow, and Darryl Zanuck's son: studio head Richard Zanuck. The 1968 color TV special "D-Day Revisited" (51:52) commemorates (a bit early, by my math) the 25th anniversary of D-Day by following Zanuck to several of the locations where the action occured and the film was shot. Amidst clips from the black-and-white film, Zanuck speaks with pride but also reticence about the film, which he intended as an anti-war statement. With war raging in Vietnam and the memory of Korea, Zanuck implies the film failed to convey its message. "Darryl F. Zanuck: A Dream Realized" (3:58) is a brief interview with Richard Zanuck about his father's work on the film. 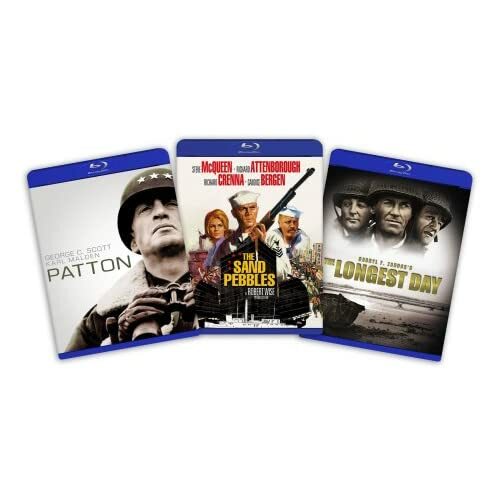 Fox provides the film's Original Theatrical Trailer (1:48), as well as trailers for Patton (1:46) and Tora! Tora! Tora! (3:40)—disc one also launches with the trailer for Jumper, on its way to Blu-Ray. The disc's Still Galleries are organized into four sections: Production, Behind-the-Scenes, Concept Art, and Marketing and Publicity. This Blu-Ray release stands tall as a definitive special edition. All site content © 2000-2019 Peter Canavese. Page generated at 04/24/2019 05:13:37PM.